There is no better start to your day than a bloody good bacon and egg sandwich and today I can happily declare I have made the best one I’ve ever tasted. Each year I insist on getting the biggest Christmas tree that will fit into my living room, they’re always locally grown, cost just £20 (for an 8ft tree) and hold their needles really well despite being attacked by cats/me after a few too many sherries. Once I’ve finally accepted that the Xmas decs need to come down (usually around February) the tree normally moves from my cottage into the chicken pen for the girls to explore. This year however it’s been bloody freezing so I’ve been snapping bits off to throw on the fire. This has made the house smell amazing and whilst tucking into breakfast one morning the flavours and smells all came together and the idea for this was born. In the past I’ve infused eggs with the flavour of truffles simply by popping the eggs in a sealed Kilner jar with a few bits of truffle (Mr Truffle sells bits of truffle as well as whole ones which are perfect for this). Before the branches are burnt the pine needles are shaken into a big tupperware box. Due to the selectively permeable shell of the egg it absorbs the surrounding aromas (hence why you should never keep eggs in the fridge) so I decided to pop a few duck eggs into a container with some pine needles and leave for a few days. The gentle pine flavour in the rich duck yolk just rocks my world. If left infusing for too long the pine would be overpowering so just around 3 days has been perfect . I’m leaving some more eggs in for an extra day to make a pine duck egg ravioli next, if it’s anything as good as this sandwich then I’m in for a real treat. Pop your duck egg into a tupperware box that contains a handful of pine needles, seal and leave for a few days. Fry your bacon in a pan until crispy, move to the side then fry your duck egg in the rendered fat. 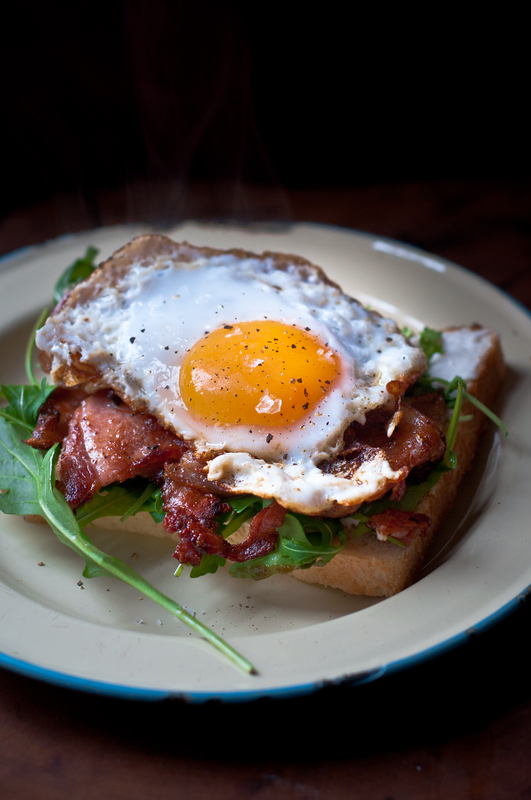 Mayo and ketchup your bread, add a layer of fresh rocket leaves then add the crispy bacon and top with your duck egg, season then pop your bread lid on and tuck in.